The Tidone Valley (excellent italian link) is situated in the western sector of the province of Piacenza, next to the province of Pavia. The Tidone river , which gives the valley its name, has its source on Mt. Penice, in the vicinity of Canedo (760 m. asl), in the province of Pavia, and flows into the river Po after about 50 Km. This is a wide valley with gently sloping hills covered by extensive vineyards, protected from the winds and full of sunshine. In the Tidone Valley there are 49 ancient fortifications, castles, etc. and the smaller but charming a tributary on the right banks of the Tidone - has another 42. The Tidone Valley is easily accessible from Piacenza via highway S.S. no. 10 westward towards Castel S. Giovanni. The "Alpine garden" in the upper valley near Pecorara; the man made lake of Molato near Nibbiano; numerous castles, medieval churches, old rural hamlets and towns. During the summer months the "Pro loco" associations of each town, are busy organizing various festivities: the gastronomic festivals of Borgonovo, Pianello and Trevozzo; the wine and grape festivals of Montalbo and Ziano; plus numerous other festivals with cultural and artistic themes. Situated in the municipality of Rottofreno. Other link to Rottofreno Just before Rottofreno we turn right towards S. Imento a small hamlet not far from the river Po (15 Km. from Piacenza). Here we find a castle with several original elements such as the square dungeon-keep and the draw-bridge tower. The parish church, built in 1291, has been altered during the centuries up to the currently Baroque style. In the one nave interior, the main altar stands out for its precious marble and for the wooden cross dated from the 1600. In the choir there is a canvas, framed in baroque style marble, depicting Saint John which was painted by Francesco Ghittoni (1885) (Italian link), an artist from Piacenza. Pre-Roman and Roman artifacts have been discovered in the surrounding area. * Our Lady of the Snow - August 5 Returning onto S.S. 10 through Rottofreno, we continue westward to Castel S. Giovanni (20 Km. from Piacenza). 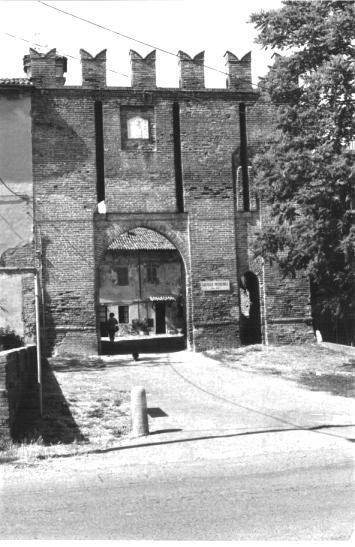 We first detour to the right towards Sarmato where the moderately intact castle (Photo of the main entrance; from the site of Sarmato's parish) of the SCOTTI - ZANARDI can be seen; this castle is one of the most interesting ones in the whole province. Back on S.S. 10, a couple of kilometers before reaching the town, we notice a small neo-gothic style chapel built in 1888 under the auspices of the Paveri Fontana family. The origin of this town dates back to 954 AD when a fortification named "Milonus" and an antique parish-church existed in the area. Before entering the town we notice "Villa Braghieri" built in the late 1600's style, now a public building, displayng frescoes and furniture of the XVIII-XIX c.
Further on there is the little church of "Torricella" or of "Sacchi" built in 1576. We then arrive to the collegiate church of Saint John, built in the XIV c. The fa�ade is divided in three parts by high pointed arches, adorned by tall pinnacles, statues and heads in terracotta. The portals are built in baroque style; a rose window is placed above the central portal. On the left and at the back stands the bell-tower with a conical spire. The interior is divided into three naves supported by massive cylindrical pillars. Also diplayed in the interior is a valuable "Christ on the cross" created by Giacomo and Giovan Angelo del Maino in 1496. Starting from the left nave we find the elegant baptismal font, made with marble from Luni, and sculpted in 1550 by the brothers Bernardo and Battista Casella. In the last chapel on the left, six wooden statues representing the "Crucifixion group" and dated in the 1500's; at the last altar of the same nave, there is a grandiose carved polipthyc altar-screen, dated 1448, similar to the one in the cathedral of Piacenza, which could also be attributed to the same artists (Antonio Burlenghi, Bartolomeo da Gropallo). At the main altar stands the altar-screen depicting "St. John the Baptist while preaching" signed by Pietro Melchiorre Ferrari. In the sacristy there is a polipthyc with rather unusual dimensions signed and dated "Sebastiano Novelli 1540" and in the presbytery a valuable reliquary from 1347 engraved with the coat of arms of the Da Fontana family. Also worth mentioning is the church of St. Rocco, built in 1476, on the same site of a pre-romanesque chapel as mentioned in a document dated 954; in the interior there are traces of frescoes from the 1400 and two wooden statues, one displaying the Madonna and Child and the other Christ deposed from the cross, both attributed to Jan Hermansz Geernaert. * Assunta (Our Lady of the Assumption) Patron Saint - August 15 We leave Castel S. Giovanni heading South on highway no. 412, towards Borgonovo Val Tidone 23 Km. from Piacenza. In nearby San Biagio, archeological excavations have brought to light Roman artifacts. Borgonovo was founded by the city of Piacenza in 1196 for strategic-military reasons. The old fortress, presently housing the municipal offices, was built in the XIII c. but has been altered throughout the ages. Built on a rectangular plan, it still displays two square towers; the rough exterior hides a very different interior where we find a tri-level gallery with the main stairs which were built in the Neapolitan style (1691). Not far stands the collegiate church of St. Mary the Assumption in a gothic-lombard style built at the beginning of the XV c. The interior is devided into three naves, supported by cylindrical pillars and pointed arches. At the main altar there is a carved wooden poliptyc adorned with polychrome statues, created by Bongiovanni and Giovanni Bassiano Lupi, both from Lodi, in 1474. In the vicinity of Borgonovo we can visit Castelnovo and Corano, both of which have castles; Mottaziana has a small castle and in Fabbiano there is a medieval tower. The parish church in Breno, dedicated to S. Ilario, was built in the XII c. still has the apsis ( the same goes for the church in Bruso) and the bell-tower in the original Romanesque style. * Fesival of the wines in Montalbo - Last Sunday of June From Borgonovo Val Tidone we proceed West and then South towards Ziano (27 Km. from Piacenza). This municipality, located on a lovely hill, is known to be a center of viticultural activities. The most famous of the wines is the "Gutturnio" which is the standard bearer of the wines produced in these valleys. In this area a fibula from the Iron Age has been found. From here one can take side tours, for a total of about 30 Km., to charming little hamlets and castles dotting the surrounding hills: Vicobarone, Montalbo (with an unusual polygonal ground-plan castle), Vicomarino, Albareto, Corano, Trevozzo (XVII c. church incorporating a XIV c. oratory), Semin� (castle). * Grand fair of August - Second last Tuesday of August We now proceed to Nibbiano bypassing Pianello, which we will visit on our way back. Nibbiano is a tranquil little town surrounded by hills, situated on the left bank of the Tidone river. A tower of the castle, originally built in 1029, is still standing. From this town one can enjoy lovely panoramic views. 3 Km. to the West we can visit the man made Lake of Trebecco built between 1921-28 whose dam boasts multiple arches. On a secondary road, to the West, between Pianello and Nibbiano there are several hamlets with very interesting castles: Carreggio, Tassara, Castelletto Cigala, Stadera, Caminata. Comune di Pecorara link From Nibbiano we proceed to Pecorara which is panoramically built at different levels on the side of the hill (45 Km. from Piacenza). The interesting parish church, dedicated to Saint George, has a Baroque style main altar and was rebuilt between 1792-97 after the original one was destroyed by a slide in 1617. From the churchyard there is a nice view over the Tidoncello valley. Proceeding towards Bobbio, after 10 Km., we can visit the Giardino Alpino di Pietra Corvo (Pietra Corvo Alpine Garden) situated at the base of the pinnacle of the same name towering at 1078 m. The garden boasts various appennine and alpine flora (e.g. orchids, rhododendrons,saxifrages,buttercups, edelweiss, bellflowers, etc.) in addition to some specimen of flora from the major Italian islands. Suggested hiking: 1) To Monte Aldone (810 m. asl) 1.5 hrs * * * 2) to Poggio Uccello (676 m. asl) 1hr * * * 3) to Monte Lazzarello (866 m. asl) 1.5 hrs. Museo Archeologico Pandora We now return towards the valley in the direction of Pianello Val Tidone (31 Km. from Piacenza). Many Roman artifacts have been found in this area. At the center of the town stands the "Rocca" believed to have been built by count Jacopo Dal Verme in 1440 but since modified. A group of volunteers belonging to the association called "Pandora" has established an archeological museum in the "Rocca" which can be visited on Sunday morning between 10:00 and 12:30 and again in the afternoon between 16:00 and 18:30 (arrrangements can be made for visits at times and days other then those mentioned by phoning at: 0523 862949). The parish church built in the 1600 has a graceful fa�ade in bricks. A must is the side trip to Rocca d'Olgisio where the castle stands atop a rocky abutment. This is one of the oldest castles in the province of Piacenza. A drive to the nearby Arcello (311 m. asl) will gratify you with a pleasant panoramic view of the Tidone Valley. From Pianello we proceed on the very scenic road to Agazzano and notice the rather charming castle of Buffalora with a mighty dungeon-keep and four square towers with machicolations . Of Roman origins and situated on the foothills of the Appennines, the charming Agazzano (24 Km. from Piacenza) has a large square in its center, where we find the town hall, hotel and numerous restaurant/bar and shops. The immense castle of Agazzano (Anguissola-Scotti) was originally built in the second half of the XIII c., has a rectangular ground-plan with a square keep and cylindrical towers at each corner. A residential palace was added in the XVIII c. This castle is one of the major attraction of the valley. The parish church, founded in 1313 was rebuilt in the XVII c.
The chronicler Alberto da Ripalta was born here (1436-1485). Recommended side trip in Val Luretta from Agazzano to: Piozzano, Montecanino (ruins of a fortification amongst the largest and best defended of the area), Rezzanello (charming and scenographic castle seen in the 1800 style; parish church - S. Savino - built 1859-1886), Monticello, Lisignano (XIV c. castle with cylindrical towers, moat and draw-bridge).